Magnificent and very rare L type Dino, known to retain much of the 206 features. Only 387 cars were produced. 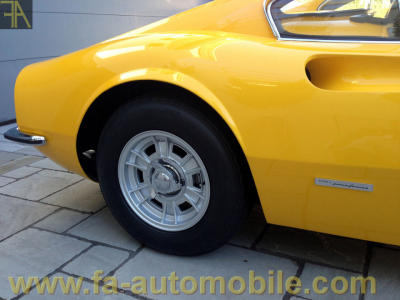 Finished in fly yellow with black interior, the car is a 1970 European delivery and completely matching numbers throughout. It comes with the desirable red book Ferrari Classiche certification. Multiple maintenance records throughout the years by Ferrari Eberlein in Germany. Fresh gearbox rebuild in 2015 by marque expert at 15,000 euros expenses. Complete set of original books and tools. Unquestionably one of the finest and most correct examples of its kind. European registered, available immediately.